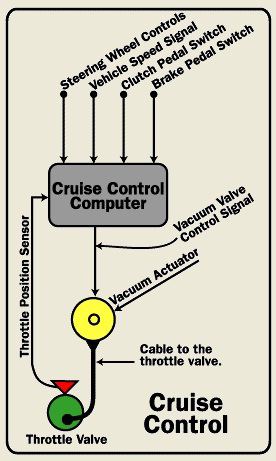 The Cruise Control is a system that is capable of automatically maintaining the desired speed (i.e. speed set by the driver) of the vehicle without the need to press the accelerator pedal. This system is particularly useful while driving at a constant speed as it significantly reduces driver fatigue. After attaining the desired speed, the driver can activate this system with the help of steering mounted controls. Usually, buttons named ON, OFF, SET/ACCL are provided. However, they vary largely from manufacturer to manufacturer. ON and OFF buttons are for activation and deactivation respectively, while the SET/ACCL button helps to actually set the required speed. But, the vehicle must attain that speed prior to setting. Thus, the system comes to know the speed of the vehicle from the speed of the driveshaft. Alternatively, it takes the input from the wheel speed sensors and sets throttle fixed at that location. In addition, the manufacturers mostly prefer vacuum operated actuator mechanism to hold the throttle in position. Almost all cruise control systems get disabled as soon as the driver touches either the brake or the clutch pedal. It means that these systems are programmed in such a way that they turn 'OFF' upon the human intervention. This system helps to improve driving comfort on long journeys as there is no need to press the accelerator pedal. It reduces driving fatigue to a great extent. It improves the fuel economy of the vehicle significantly. This system is not useful in heavy traffic conditions with varying speeds. Its inability to recognize the road surface may lead to skidding on wet or icy surfaces. Please find additional information on the subject here. 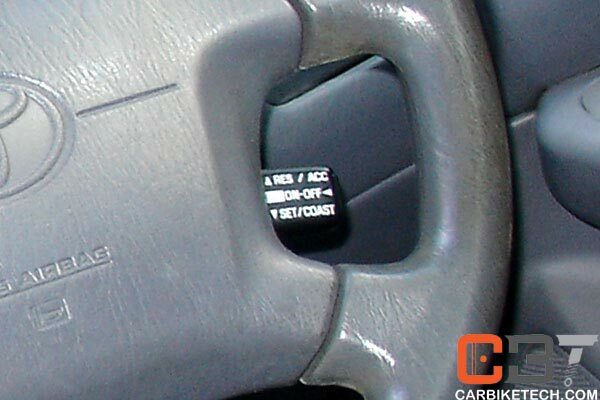 Home » Technical Anatomy » What is Cruise Control system in cars?